The Cafu SDK comes with a Materialviewer program, that can load and render a material in the same way the engine would. The program is therefore a very useful utility to test your materials and see how they will look in the engine. Please use the -m option in order to specify the desired material! defined in one of the material script files (see below). scripts and the materials associated textures. into each specified script for a definition of the material. find in Games/DeathMatch/Materials, so you probably don't need it as well. and loads the renderer with base name RendererXY instead. Only provide the base name (e.g. RendererOpenGL12), no path and no suffix. 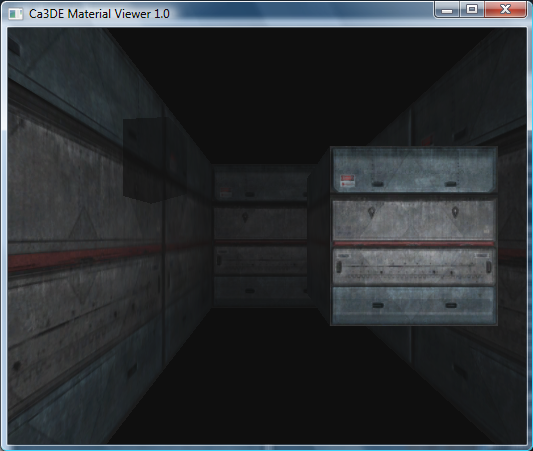 The Materialviewer window contains a cube whose faces are applied with the selected material. The cube is surrounded by 4 walls, that have also the material applied. The bottom and top of this “room” are colored black. You can turn on up to 4 dynamic light sources, that move around the scene and illuminate the cube from different angles. Light sources come in 4 colors (white, red, green, blue) and can all be activated separately using the keys 1-4. ESC Quits the program, same as ALT+F4. 1 Toggles if white light is visible. 2 Toggles if red light is visible. 3 Toggles if green light is visible. 4 Toggles if blue light is visible. W or Arrow key up Moves the camera forward. S or Arrow key down Moves the camera backwards. A or Arrow key left Strafes the camera to the left. D or Arrow key right Strafes the camera to the right. Further on you can change camera direction along the x axis by holding down the left mouse button and moving the mouse left or right.